In modern hospitals and biomedical measurement systems it is necessary that medical measurements should involve the simultaneous transmission of several parameters. For this type of application a multi channel telemetry system is employed. The multi channel systems permits the transmission of the parameters such as ECG, heart rate, respiration rate, temperature, blood pressure etc. Simultaneously from different patients (channels) and hence called multichannel telemetry system. Multiplexing technique is the basic principle behind the multi channel telemetry system. For multi channel radio telemetry, various channels of information are combined into a single channel. There are two basic multiplexing methods used in bio-telemetry system. In this type of multiplexing system we use the principle of frequency division multiplexing where each signal is frequency modulated on a sub carrier frequency. Then these modulated sub carrier frequencies are combined to modulate the main RF carrier. At the receiver side proper filters (preferably band passes filters) are used to separate the modulated sub carriers. The individual signals from different patients are recovered from these modulated sub-carriers by the second set of discriminators. Since we use different subcarriers for different channels, the channel data can be easily decoded. One important factor of the FDM telemetry system is the frequency of the sub carriers. It has to be carefully selected with proper change among them to avoid interference. The presence of noise can severely affect the performance of a telemetry system as the measured signals are of minute amplitude. The low pass filters are used to extract the signal without any noise. 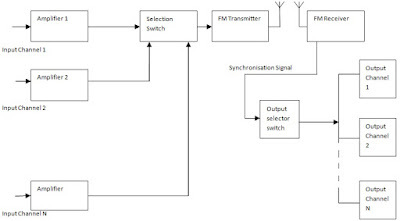 The block diagram of FDM telemetry system is shown below. 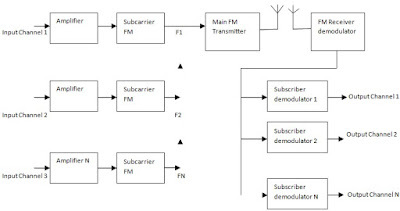 Double modulation is the main feature of FDM telemetry systems. Double modulation simple means modulating twice before transmission. Here each signal is frequency modulated on a sub carrier frequency and then these modulated sub carrier frequencies are combined to modulate the main RF transmitter. Hence we use the term “double modulation”. Most of the bio-medical signals have low frequency and bandwidth requirements. So FDM telemetry system cannot be used regularly. 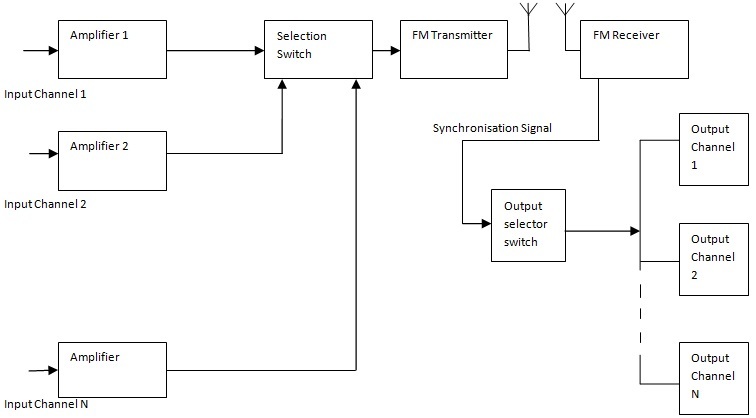 We can use time division multiplex system by the time sharing scheme where the transmission channel is connected to each single channel input for a short period of time to sample and transmit the signal. A selection switch is used in order to select the channels in an ordered way. Then transmitter is switched to the next signal channel in a definite sequence. After scanning and transmitting all the present channels a cycle is completed and next cycle will start and this operation is continued. At the receiver side the opposite process is done. 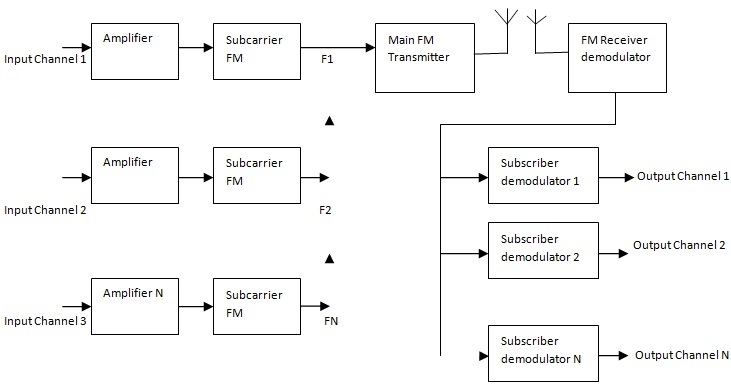 The block diagram of TDM telemetry system is shown below. Since the synchronization of the signals is a must for a time division multiplexing system, a synchronization pulse is used at the receiver side. It is used to decode the information from individual channels in the proper way. The absence of synchronization will lead to severe interference among the channels in almost all cases. The output is decoded and by using suitable filters, information from each channel is separated. This is a special type of telemetry system with simple deign. This type of telemetry system provides greater freedom of movement to patients during labour, and under all conditions the patient is continuously monitored through a wireless link. The telemetry system is designed in such a way that the patient carries a small pocket sized transmitter which picks up signals for foetal heart rate. The receiver is located away from the patient. Telemetry of more stable parameters such as body temperature etc needs more accurate design. The temperature telemetry system normally uses a thermistor in order to measure temperature. Thermistors have advantages such as small size, low cost, wide temperature range etc.